Facebook management says that the new policy will help it tabulate data which can be used to serve precision adverts to the users and avoid serving unwanted information to them. The saving grace is that you can opt out for some parts of the new policy by customising privacy settings. You can visit Facebook website settings page here and opt out of advertising that is shown on third party sites or is selected by comparing you with your friends. 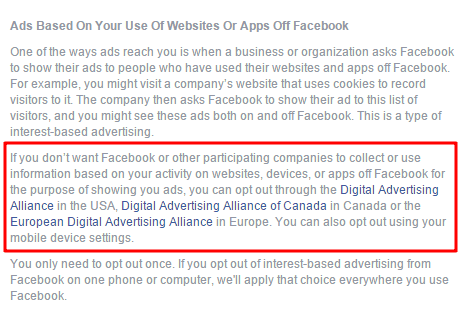 If you want to opt out of Facebook tracking your use when you are not on Facebook, you can opt out by visiting individual pages listed in the privacy settings page for respective countries. Facebook says that users can do so even from their mobile and tablet screens and the settings is will be treated as same across the board. Using tools like AdBlock Plus and Ghostery can block the tracking to begin with. Use incognito (private) browser mode only for facebook , and all other tabs on non incognito mode. So logged-in session from facebook will not affect your browsing on other pages.